Interim report: Why do students use lecture capture? Presentation at Lecture Capture: Building the Evidence Base at Loughborough University, 17 December 2014. Available on SlideShare. Watch the presentation online via Loughborough Review Lecture Capture. We presented an initial progress report on our lecture capture research project, currently running with thanks to Rob Stone and participants from the Department of Psychology. This project aims to address the rhetoric around lecture capture use, seeking to elaborate on why students use lecture capture, rather than just explore when and how often they use it. Crucially, this research project hopes to understand student study behaviour both in and out of class and how lecture capture may play a role or add value to students’ study experiences. Unlike other studies in this field, which focus on quantitative data drawn from surveys or experimental approaches, this study seeks to explore students’ study processes using diaries and semi-structured interviews. 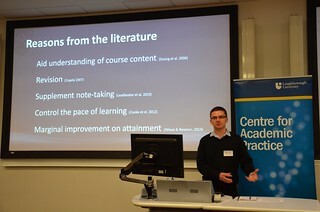 Our presentation touched on a number of themes, including a critical perspective on both the use of attainment measures in studies and the lack of interrogation of student perceptions commonly raised in the literature, such as the importance of lecture capture for revision or note-taking. It is hoped that our findings, due Autumn next year, will provide a greater focus to go beyond claims that students find lecture recordings ‘nice to have’ and instead explore how lecture recordings form an integrated part of their study processes. The initial themes that have emerged are in the slides linked above and there are a number of references to follow up from the presentation if you are interested in a critical perspective of this field. The study is ongoing and Departments using lecture capture that would be willing to participate are encouraged to contact james.youdale@york.ac.uk. Similarly, if you have any questions or would like further information on this project, please feel free to contact me or post a comment below. Presented here are approaches to evaluation of technology-enhanced learning practice undertaken by the ELDT and colleagues across the institution. Methods and approaches to evaluation are explored in more detail in our Learning Design & Development pages.